Our ranch really began with an ad in our local newspaper. Boyd saw a notice featuring, “Longhorns For Sale” in Afton, Wyoming. We ended up purchasing one bull and two cows to serve as pasture ornaments, really. But they became the beginning of our longhorn herd! Boyd and I met Durrel Farnsworth at a longhorn show in Salt Lake City, Utah, which we were attending as spectators. 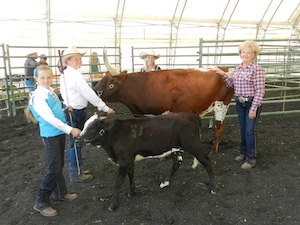 After attending another show in Kanab, Utah, we purchased a heifer (7-11 Highlites) from Durrel and we still have her. In fact, she has produced two of our most outstanding steers! Another great purchase that established the foundation of our herd came from Doug Hunt. Miss Rodeo was a beautiful cow that contributed several successfully shown cows to the herd. She, herself, was an award-winning show cow. We went on to purchase a bull in partnership with Doug, Hunts Super Expectation. This bull has also served as the foundation of our herd, giving us many fine cows. I am always working to improve our herd. A huge ‘thank you’ to Doug Hunt and Durrel & TJ Farnsworth for their genetics, inspiration, and guidance!